Alabama Gov. Robert Bentley resigned Monday as part of a plea agreement with prosecutors, who allege that Bentley abused his position as the state’s chief executive to cover up an affair with his former aide Rebekah Caldwell Mason. “I can no longer allow my family, my dear friends, my dedicated staff and cabinet to be subjected to consequences that my past actions have brought upon them,” Bentley, a Republican, said at a Monday-afternoon press conference, according to the Huffington Post. “Though I have committed myself to working to improve the lives of the people of our state, there have been times that I have let you and our people down, and I’m sorry for that,” Bentley added. The plea deal requires Bentley to resign and serve a year of probation. He is also required to perform 100 hours of community service and forfeit some $36,000 in his campaign account, the Huffington Post reports. Bentley expressed faux remorse during his resignation speech; you know, the kind of faux remorse that comes from politicians who’ve been caught up in messy scandals. Didn’t matter to Bentley, now 74, that his colleagues had been calling for his resignation for years after tapes, recorded by Bentley’s wife, surfaced in which the Republican governor professed his love for his 45-year-old mistress. Dianne Bentley filed for divorce in 2015 after 50 years of marriage, and Mason immediately resigned once the tapes became public. Bentley, however, stayed in his position until he was forced out. In taking the plea deal, Bentley avoids jail time. According to Birmingham News columnist John Archibald, Bentley was facing four felony counts that would have carried serious prison terms had he been found guilty. 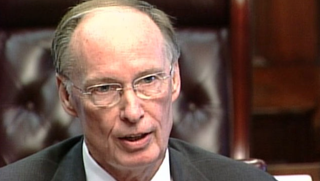 By taking the plea deal, Bentley also agreed that he would never seek public office again. Lt. Gov. Kay Ivey, a Republican, was sworn in to office shortly after Bentley’s resignation. The Huffington Post notes that Ivey is the second woman to serve as the state’s governor, following Democrat Lurleen Wallace, who served between 1967 and 1968. Read more at the Huffington Post and MSNBC.